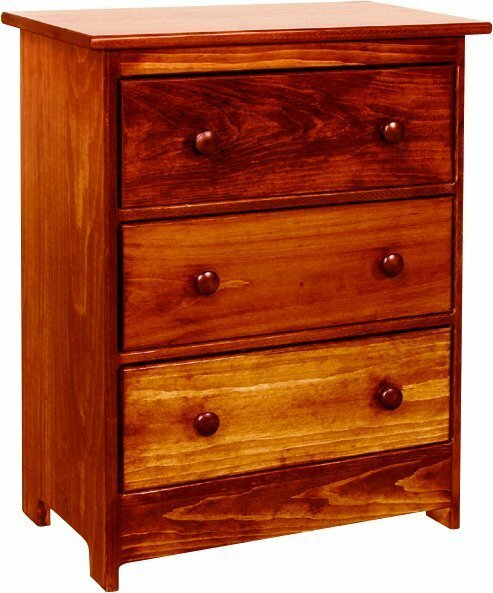 From the Heritage Pine Collection that's Amish made in Pennsylvania, we offer the Amish Pine Three Drawer Chest Night Stand. This pine chest wears country style comfort beautifully and it also wears a very attractive price. Pine is the solid wood to come to for solid wood benefits and beauty at a lower price. This pine chest offers three drawers. Use it in the bedroom for clothing or the hallway for extra blankets. Cute and cut perfectly, there are endless options for you when it comes to a custom finish for this wood chest. Pine furniture provides a canvas for fun finishing options. Its natural character shines brightly and it fits country and cottage styles to a tee. Please email or call us with any questions. Thank you for shopping DutchCrafters pine furniture.